Edited by Tower Site's own Scott Fybush - and available now in print or as an e-book! "Big Trip 2007" covered parts of Utah, Wyoming, Idaho, Montana, Washington and Oregon over two weeks in late August and early September. 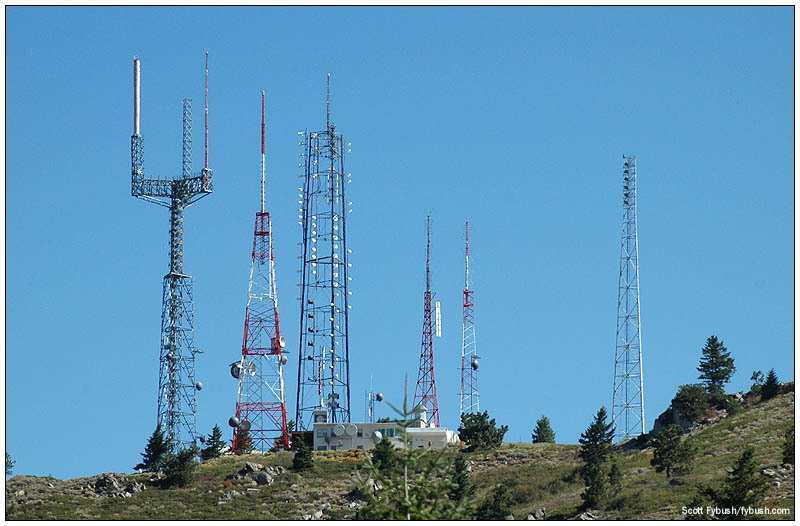 We wrap up our look at the sites of Boise, Idaho with what is, unquestionably, the most impressive group of towers in the market (and, as best we can tell, anywhere in the state). 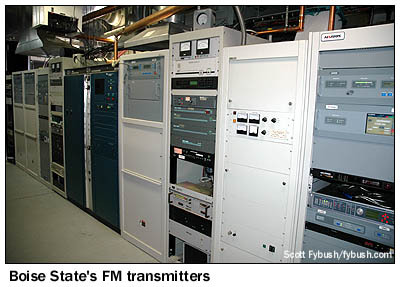 If you were paying careful attention to the Big Trip installment two weeks ago that included the studios of KTVB (Channel 7), Boise's first station, you might recall that we briefly touched on the history of TV transmitter sites in the market. When what was then KIDO-TV signed on in 1953, broadcasting from Crestline Drive in the foothills that rise just east of downtown Boise. That site provided adequate coverage of the small town that Boise still was back then - but later that year, competitor KBOI-TV (Channel 2) took to the airwaves from a much loftier elevation. That would be Deer Point, the subject of this week's Site of the Week installment, more than 7000' above sea level and some 4200' above the Treasure Valley. 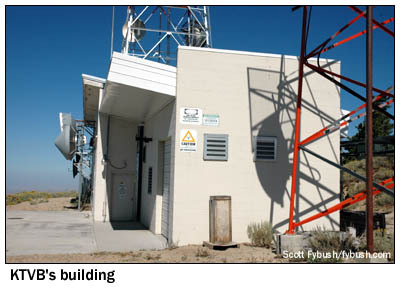 By 1956, KIDO-TV had joined KBOI-TV up at this site, and today this ridge 11 miles northwest of downtown Boise is home to substantially all the market's TV signals and nearly all of its FMs, too. The view above is the vista that greets travelers not long after they turn off the paved road to Bogus Basin Ski Area onto the unmarked side road that leads up Shafer Butte to the Deer Point site. 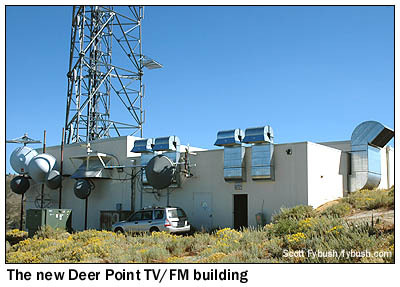 Viewed from north to south, these towers are the "new" DTV/FM tower, the KBCI-TV (Channel 2, formerly KBOI-TV) tower, the KTRV-TV (Channel 12) tower, the KTVB (Channel 7) tower, the KAID (Channel 4) tower and the KSRV-FM (96.1) tower. KTVB and KBCI have by far the oldest towers on the mountain, of course. At the center of the cluster, KBCI was here first, and it certainly looks like it's still on its original building, judging by that nifty turret on top. Downhill a bit, KTVB is still on its original 1956 tower, joined right next door by the 1971 tower for Idaho Public TV's KAID. Next up on the mountain, TV-wise, was Nampa-licensed Channel 6, which signed on up here in 1974 as KITC, then took its current calls of KIVI a year or so later. KIVI's original tower is gone now, and in its place rises the "new" DTV tower, erected here in 2001. 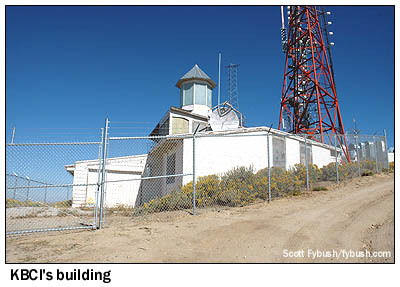 We didn't get a chance to see inside the multiple rooms that make up the concrete-block building at the base of the KTRV tower, but thanks to Bill Frahm, we did get to peek inside the building below the new tower. This was once the KIVI building, but has been renovated and expanded to handle multiple new tenants on both the FM and TV sides. 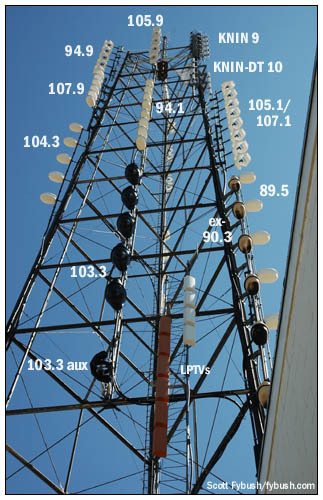 FM first: feeding the six-by-two CBR panel antenna mounted just below the candelabra part of the tower is a combiner that's fed by six FM stations: Citadel's four signals (KKGL 96.9, KIZN 92.3, KZMG 93.1 and KQFC 97.9) and Boise State University's two public radio signals, KBSU-FM 90.3 and KBSX 91.5. 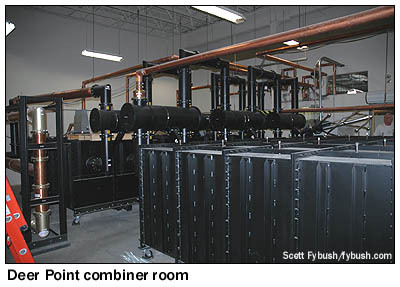 Harris transmitters are the standard up here, but there are a few BE boxes in use as well. There's a combiner back in the TV room, too, sending KAID-DT (21), KIVI-DT (24) and KBCI-DT (28) up to the master DTV antenna on one tine of the candelabra. 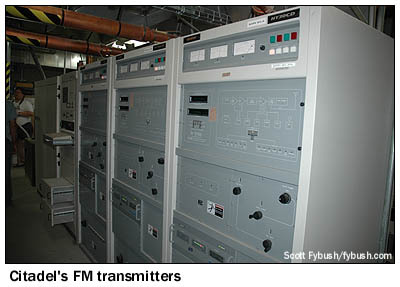 KIVI's analog signal on channel 6 occupies another tine, for now, while a third sits empty. 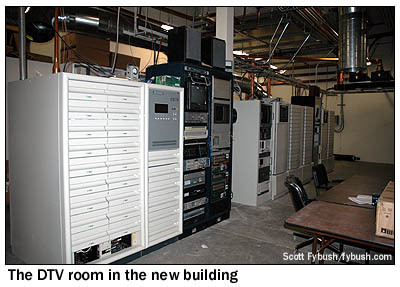 The only other remaining DTV up here after February will be KTVB-DT, which will return to channel 7 from the present KTVB tower, where the interim KTVB-DT on channel 26 is now side-mounted. 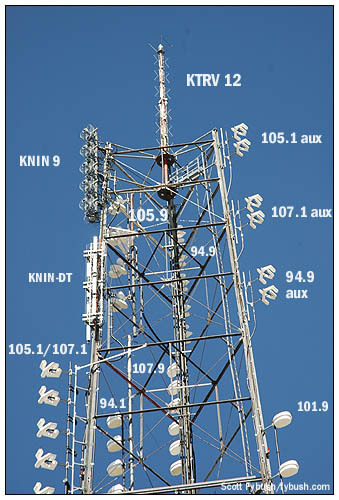 That leaves one more tower here: KSRV-FM (96.1), licensed to Ontario, Oregon, moved up here just a few years ago, building its own tower and side-mounted antenna at the southern end of the cluster. It's a tribute to the amazing coverage from this site that KSRV ("96.1 Bob FM") has no trouble reaching its city of license, more than 60 miles to the west, from way up here. Next week, we'll move on from Boise to the sites of Twin Falls, Idaho. And in the meantime, stop by Tophour.com next Wednesday to hear the second of three installments of Boise IDs. Thanks to Bill Frahm for the tours, to Bill and to Journal's Rockwell Smith for additional background information, and to Frank Aden and the History of Idaho Broadcast Foundation for making these visits possible!